Home→Spirograph→What is the radial distance between the holes in Spirograph wheels? 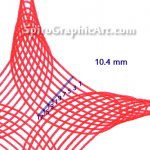 What is the radial distance between the holes in Spirograph wheels? 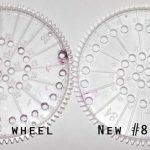 A reader asked whether the hole numbers on the Spirograph wheels correspond to the distance from the edge in millimeters. The answer is “not quite”. They are very regular, however, which is one of the reasons that the designs are so interesting and appealing to the eye. So how to measure how far apart the holes are from each other in terms of the radius of the wheel? It’s hard to tell by looking at the wheels, because the holes are laid out in a spiral. That’s because the diameter of the holes is bigger than the radial distance between them. If the holes were laid out in a line, they would overlap. The integrity of the round holes would be gone. You wouldn’t be able to draw patterns, and the wheel wouldn’t hold together. 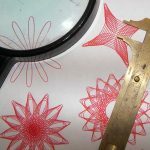 However, when you draw a design like this one, you line up each hole at the same spot on the ring before you draw its individual pattern. Let’s look at the lines drawn by the holes in this pattern and measure the distance between them. This pattern is drawn using holes 1, 3, 5, 7, 9, 11, 13, 15 and 17. 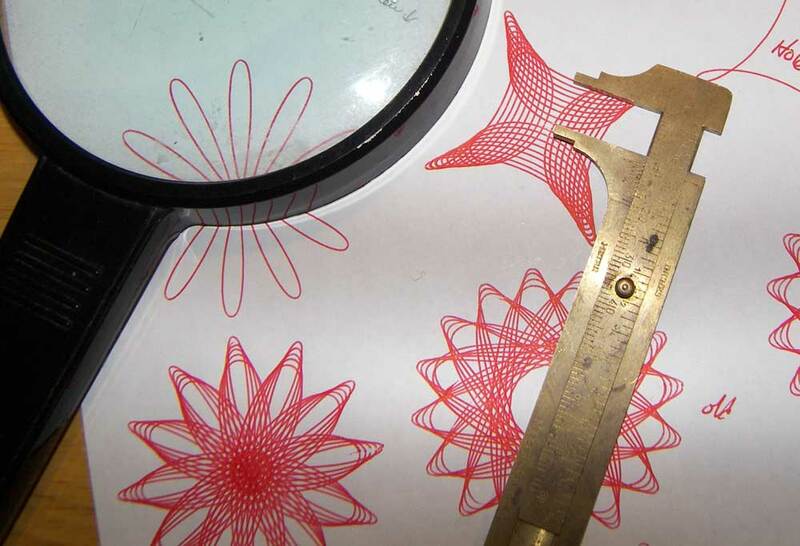 It was drawn with my old Spirograph. Since the distances are small and hard to measure individually, let’s measure a number of them together and divide. From hole 1 to hole 17, with the best accuracy and precision as I can manage with my little vernier caliper, is 10.4 mm (0.409 in). Divide 10.4 mm by 16, because there are 16 spaces between holes 1 and 17, and you get 0.650 mm (0.0256 in). My result: 0.650 mm (0.0256 in). This result should be independent of the size of the holes and the size of the pen used, as long as the holes are the same size and you use the same pen throughout. I also think it’s the same with all the wheels, because that’s how the designers of the set made it. To my eye, all the patterns produced have a similar distance between the lines, but I haven’t measured this yet. I hadn’t actually asked myself the question until doing this, but I’ll experiment and report in a future post. I used the wheel and ring from my old Super Spirograph set for this particular drawing. Comparing designs made with the old set and the new set shows that the old set is more precise. I’ll make more posts about that in the future. Quality really shows when you’re drawing fine lines close together. Like any good scientific experiment involving measurements, others should try it themselves and see if they can replicate my results. Let me know how you do in the comments below. 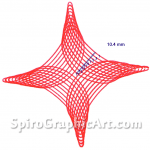 My new Super Spirograph just arrived in the mail today. The first thing I did was to repeat your interhole distance measurement for #80 gear going around #60. I drew curves through holes 1,11,21,and 31. The distance between 1 and 31 was 19.8 mm, giving 0.66 mm average. Very close to your 0.65! However, the distances for each 10-hole interval were not equal. Between 1 and 11 was 5.8 mm and between 11 and 21 and between 21 and 31 it was 7.0 mm. I’m planning more measurements in the future to get a clearer idea of how the holes line up, but I thought you might be interested in my preliminary results. I certainly enjoy your blog. Thanks for your contribution Harold. As you see from the diagram, I didn’t measure as many holes as you did. I’ll go at it again sometime too, using my old Spirograph parts. I should think that the higher-numbered holes are harder for the manufacturer to fit in, especially in the new sets which have larger holes, so may be less regularly spaced. Do let us know about any other results you get. I love the website. I found it while researching the different models that were made so I can make an informed decision when buying one on eBay. I decided I want an original 1967 Kenner model like I had as a kid because it has the most wheels and is the most precise according to you review. I’m not that interested in sets with extra tracks because I like the trochoids that the wheels make, themselves. I want to make a visual guide showing the patterns of every possible combination of wheels, rings, and holes. I will generate this using a script but I need the exact measurements of the wheel and ring diameters, tooth height and base width, and radial positions of the holes. Are you able to supply these? I will gladly email you a copy for the site when it’s done. I’m glad you’ve found the site useful. I don’t have exact measurements, nor the means of producing them. They would require very precise measuring instruments which I don’t own. All I have is the little calipers in the picture. This particular article is as far as I’ve gone in measuring radial distances. 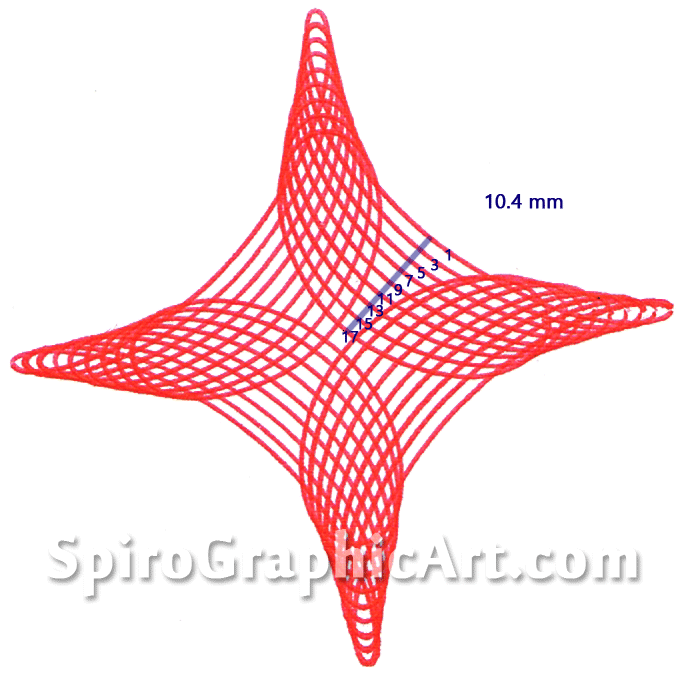 I often hear from people who have found old Spirograph sets on ebay, etc. Hopefully you can find one and take measurements from it. Good luck! And feel free to share your work with us. The site attracts all kinds of people from artists to geeks, and some will be interested for sure. OK, thanks. I just bought an original British ‘Spirograph By Denys Fisher’, the German inventor of the toy, from 1965, 2 years before the 1967 Kenner version in the U.S. I am still looking for a deal on a Kenner 1967 version to compare. I want to be really accurate and do the guide for the original Kenner set first if there are differences. Wait until they go on sale for $9.99, which happens often. You can subscribe to sale notifications. Quality test a few for smooth operation and repeatable accuracy. Make sure it remains at 0 when you turn it off and on again. Get only this one with the gray plastic readout. Item #68304. It is the latest improved model. Don’t get either of the old ones with the old black readout. Item #47257 or Item #61585. Cool. I should think the Denys Fisher version would be as well made as any. According to Wikipedia, he was an English engineer. Yes, it is no doubt well made as everything from that era was. Yes, he was English. I was thinking of someone else. Just when I was having fun with the rogue version when I should be working! It generates wonderful patterns. I’ve been wanting to play with it and write about it. Yah, I don’t know where that rogue version came from. It’s difficult to use and the patterns don’t always close. The original ones, developed by Andy Katz, are much better. I told him how he could improve them by using splines so they generate nice smooth scalable patterns now. The interface is all point and click. That spirograph program is Windows only. I use a Mac. But I prefer to write my own code anyway. Thanks for the review…. I just lost another 20 min of my life, lol. I see a review article about simulators in my future, but they will need more study. A holiday project, perhaps. Heh heh. Sorry about that… Have a great Thanksgiving holiday. I just lucked out on eBay and got an original Kenner 1967 Spirograph, red tray, in pristine condition with the manual and pin board intact. It should be interesting to compare this with the Denys Fisher version. I will report on any differences. She is a kindred spirit. I mentioned your site in a comment.